Last week we had some fun with plastic Easter eggs and pompoms. The blue basket that we used looked a little plain so I decided to make it more festive! I’ve just started working with Baker Ross, a UK-based company who offer a wide range of craft materials. We used some of their fabric petals, flower gem stickers and self-adhesive pearls and gems to decorate our dollar store container. In preparation for our main activity I painted the inside of an egg box with several layers of yellow paint. Obviously this step is optional but I thought it looked more spring-like! I provided F with the egg box, the decorated blue basket, some plastic eggs and some super-cute bunny egg tongs that I found at the craft store. I think they are for lifting eggs out of dye, but they worked great for this activity! F was very intrigued by the egg tongs, although he found them quite hard to operate properly. But he did manage to transfer some of the plastic eggs into the egg box – using his own way with tongs! Unfortunately he gave up with the tongs and transferred the rest by hand. We tried the activity again another day, this time starting with the eggs in the box already. He found the eggs hard to pick up from the egg box compartments, so with each egg he took it out by hand and put it on the table, then used the tongs (with two hands) to pick up the egg and drop it in the container. He diligently sat and transferred each egg with great concentration – I was so impressed! And he was so pleased with himself when he’d completed the task! Baker Ross products can be bought from their website (if you are based in Europe) or from Amazon.com (if you are US based). But enough about us, check out what the rest of the team has been up to this week! Awesome! That looks so fun! He is a determined little guy! Those craft supplies are adorable! Love how you guys decorated the basket- too cute! I need to get some of those bunny tongs! Looks like lots of fun! 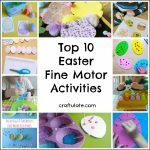 I love the activities and the craft supplies! I love those tongs! I haven’t seen anything like that in the Netherlands, but I’ll have to keep an eye out- they look like so much fun! We have a pink pair of those tongs- so fun! And I totally love your painted egg carton; it does look more spring-y ; ).